A full length mezzotint portrait by James Watson after the painting by Joshua Reynolds; published in London circa 1768. This beguiling portrait depicts Mary, the second daughter of William Chaloner who married Colonel John Hale in 1763 with whom she bore 21 children. 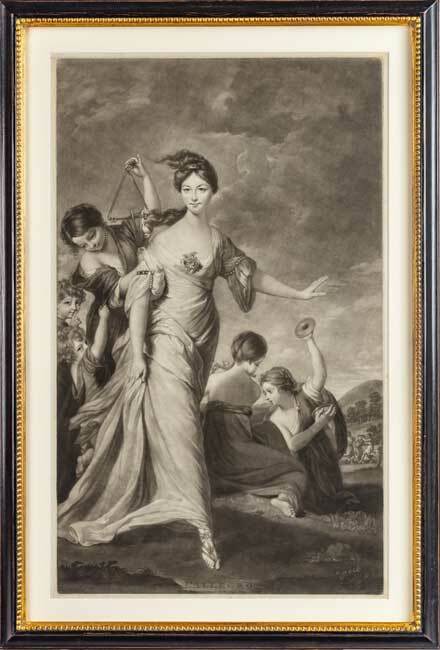 She is depicted in flowing white robes as one of the Three Graces, Euphrosyne (Good Cheer) and in Watson's mezzotint she is named L'Allegro alluding to Milton. She is attended by children and various musicians playing the triangle, cymbals and flute. The original oil painting was commissioned by Colonel Hale's cousin Edward Lascelle and was intended to decorate the new music room at Harewood House in Yorkshire.